For PEN’s 2018 Day of the Imprisoned Writer, we asked PEN members and supporters to send a message to a jailed writer. Rui Umezawa is a novelist, storyteller, essayist, children and young adult writer. His book ‘Strange Light Afar: Tales of the Supernatural from Old Japan,’ (Groundwood Books) was listed as one of the best books of 2015 by the CBC and his first novel ‘The Truth About Death and Dying’ (Doubleday, 2002) was nominated for the Commonwealth Writers Prize. Dawit Isaak is one of several Eritrean journalists who were arrested on 23 September 2001 during a government crackdown on the independent press. A dual citizen of Eritrea and Sweden, he was co-owner of Setit, a twice-weekly newspaper, and worked there as a reporter. On 18 September 2001, the government banned all privately owned print media. The following week, prominent public figures who had called for democratic reforms were rounded up in a series of police raids and the authorities closed the newsrooms of seven independent publications in Asmara. Dawit, who was 36 years old on the day of his arrest, was one of the journalists who has been held in Eritrea’s prisons, without charge or trial, since then. As always, I hope my letter to you finds you well. It was on Nov. 15, 1981, that PEN International began observing the Day of the Imprisoned Writer. 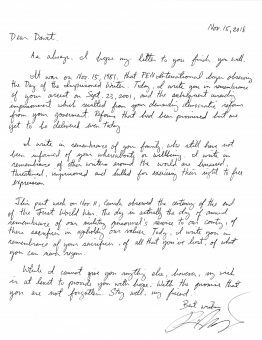 Today, I write you in remembrance of your arrest on Sept. 23, 2001, and the subsequent unending imprisonment which resulted from your demanding democratic reforms from your government. Reforms that had been promised but are yet to be delivered even today. I write in remembrance of your family, who still have not been informed of your whereabouts or wellbeing. I write in remembrance of other writers around the world who are harassed, threatened, imprisoned and killed for exercising their right to free expression. This past week on Nov. 11, Canada observed the centenary of the end of the First World War. The day is actually the day of annual remembrance of our military personnel’s service to our country, of their sacrifices in upholding our values. Today, I write you in remembrance of your sacrifices, of all that you’ve lost, of what you can never regain. While I cannot give you anything else, however, my wish is at least to provide you with hope. With the promise that you are not forgotten. Stay well, my friend.